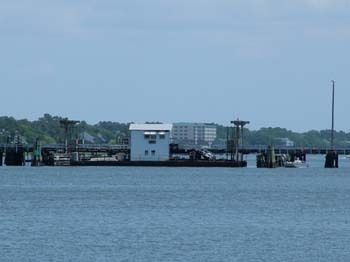 May 15 - We are anchored in Charleston and I think Jack Sparrow, I mean Captain Jack Sparrow, was here. This reminded me of the sailboat Captain Jack Sparrow stepped off of in Pirates of the Caribbean. We have down two anchors and decided to settle in for the week. It ends up that the tall ships are coming to town and should be arriving later this week for the show on Friday through Sunday. 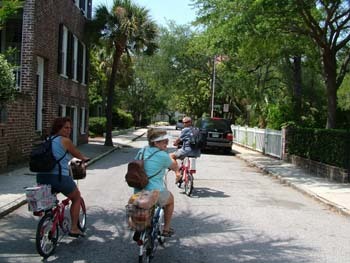 We took a walking trip of town on Saturday and then we took our bikes in and rode everywhere on Sunday. 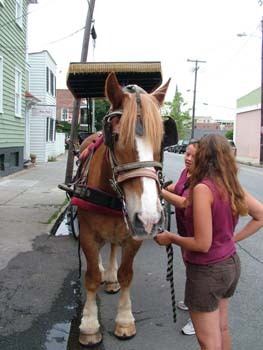 We also took a carriage ride and this is our horse Duke. They were getting him all hitched up when I took the picture. To the right you can see they shoe him with rubber shoes. The lady told us that some of the horses have figured out if they can throw a shoe then they get a day off. 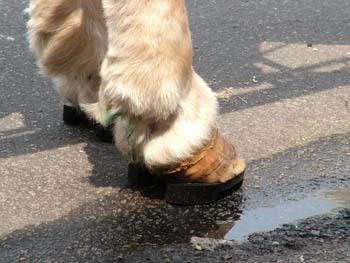 Some of the horses like that day off and try to throw the shoe. These are horses they have purchased from the Amish after they have used them for farming. We had a great tour guide who was also an author. 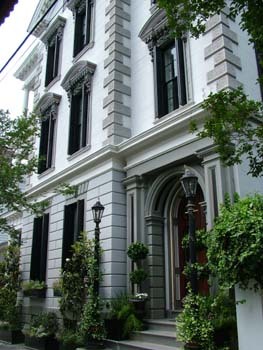 In Charleston, there are three tour routes and you don't know which tour you are going on until the lady with the city comes out of the booth and puts a plate on your carriage. The guides have to be experts on all the routes. 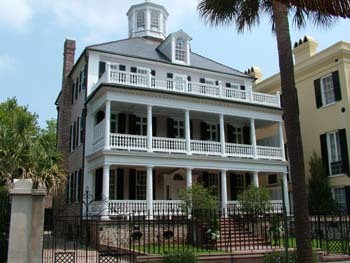 Of course, I'm sure you see houses on all of the tours. These are just some of the homes we saw. 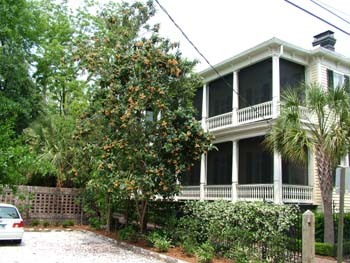 They are classic with the porches on the south side to allow the windows to be open all the time and keeping the house cool from the trade winds. The home just to the lower left sold last year for 7.8 million dollars. Not bad, I'll bet they are still working however. 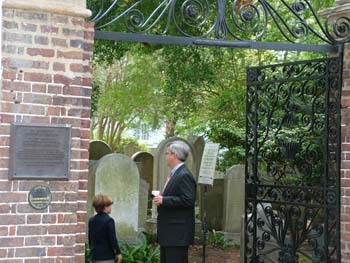 Above right, you can see the cemetery it the side of the church. 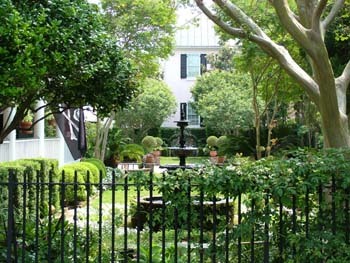 Behind or beside each of the homes are wonderful gardens. This one happened to be visible from the street. They really like their gardens in this area and I can see Deb and I sitting out there enjoying the beauty. 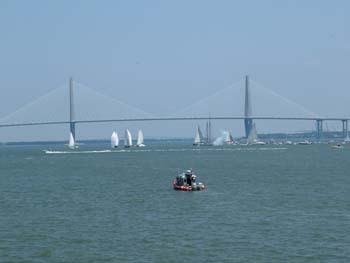 To the left is the Cathedral in Charleston. The marks you see stamped into the bricks are stars. There is a star for every person from the Confederacy that died in the Civil War. This is a stark reminder of the cost of war. 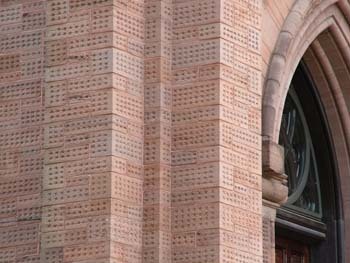 You could see the stars on the entire church on every brick. 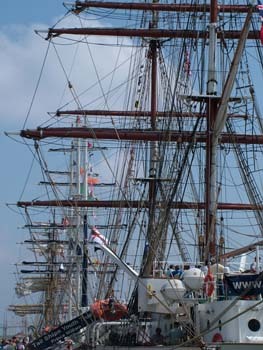 I mentioned earlier the Tall Ships were coming. This is a new one which was built for South Carolina. They were working on it trying to get it ready for the big show and dedication. I sent an email to volunteer to work the docks but no response. We will go to the show early on Friday and get some good pictures. Anchoring has gotten interesting too. To the left you can see a trawler that didn't get his anchor set and drifted back into a bunch of other boats while he was trying to get it back up again. He was finally successful and went elsewhere to anchor. Today, Tuesday, our friends Bill and Christy had a boat anchor near them last night and with the change in tide it is obvious he was too close. At one point they could reach out with a boat hook and push it away. I gave them my friend Gary's solution which is to tape a permanent marker to the boat hook and fend off with it. They laughed but didn't do it. Yesterday and today we have had boat days and pretty well stayed on the boat both days. I was able to get all the points for the trip entered in the Microsoft Mapping program. This is a cool program although the satellite pictures aren't as good, I like it because of the push pins. Try it out if you haven't seen it already. 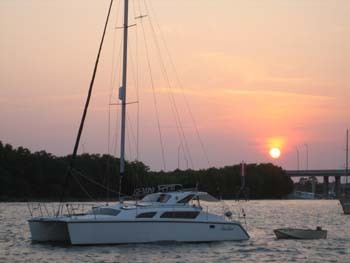 May 20 - The same evening, Bill and Christy took this picture of our boat at anchor in Charleston. I really liked the sun setting in the background. The next day, we went to see if more tall ships were coming in. 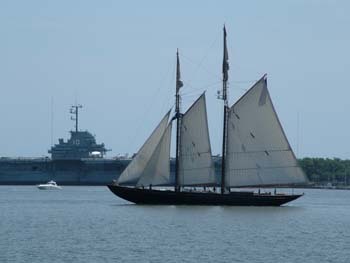 We actually got to see the Virginia coming in from see with her sails up. I was able to get the picture on the lower left as they arrived. 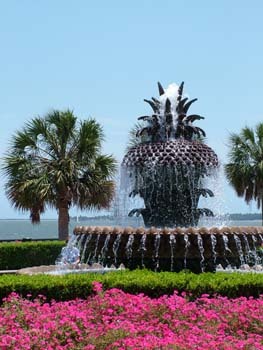 To the right you can see a great fountain with many flowers and if you look through the water on the left side, you will see some tall ships anchored off-shore. On the way home, we went shopping at the Harris Teeter supermarket. If anyone ever wanted to know what it was like riding bikes back from the grocery store, this is it. You can see Bill up front, Christy to the left and then Deb. We had a good ride back and took all of our groceries to the boats. As we were heading north, we were contacted by a couple who are building a KR. 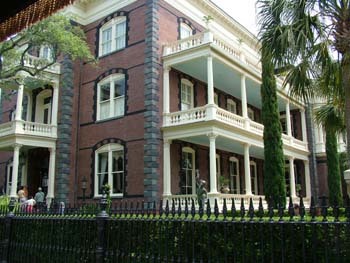 They lived near Charleston and wanted to show us the town. 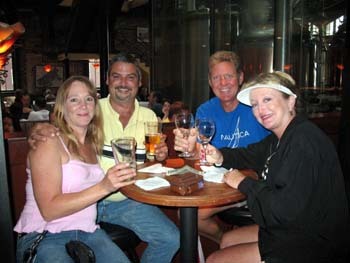 We were able to get together on Thursday and we had a great time. To the left you can see Aimee, John, me (Jim) and Deb. 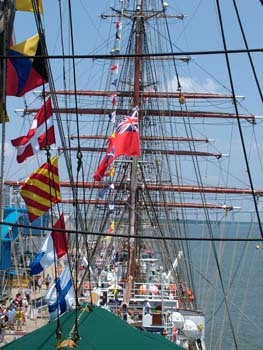 We walked from the straw market out to see if more tall ships were arriving and were lucky to see this ship coming in. We didn't hear it but we were told they were all singing as they approached the dock. You can see they have two tugs pushing the ship into the dock. I thought they would grade the docking based on how many people fell from the yard arms, I was told that wasn't too funny. 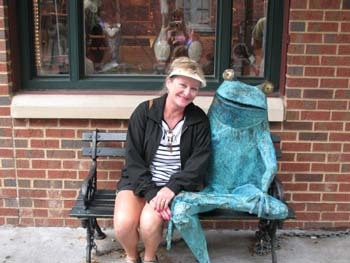 Lower right, you can see a picture of Deb and the "local" frog. The store was pretty cool but I think we all liked the frog the best. John and Aimee have a favorite restaurant with a band and I now understand why. 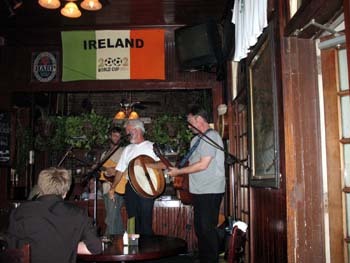 We stayed through the first set, which was an hour and a half, to hear some really great music with an Irish beat. The place was called Tommy Condon's and the food, music, and company was excellent. While we were there we met some people who were sailing on one of the Tall Ships. They pay to cruise with them or I guess I should say they are trainees. One of the ladies had been on the ship for a year, off and on. She loved the experience and we actually saw her the next day on our tour. We ended the evening with some dancing and great conversation. We have had a great time with all of the people who have asked us to stop by and are looking forward to more experiences in the future. Friday brought us to Tall Ship day. 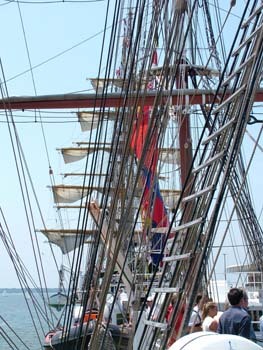 Of course, I loved touring all of the ships and wished I could have climbed one of the masts. They, of course, wouldn't let me. 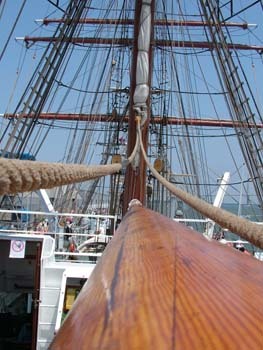 Below I have a number pictures I took of the rigging which I think makes the Tall Ships so attractive. Do you remember the ship we saw docking with all of the crew on the yard arms? This is the polished silver name plate inside their boat. They were from Colombia and based on our visit with them I would love to go visit the country. Of course, our country doesn't advise it. The people I talked to were trying to learn english and I worked with one of them on some pronunciations he was having trouble with. I know someone will help me with spanish someday. 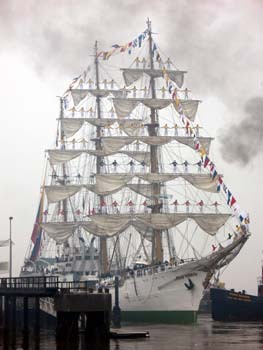 The Colombian ship actually let us go up higher and I was able to get the picture to the left. Looking down, you can see the green awning. Under the awning they play some soccer, basketball, and did their daily exercise. This ship was the same one you also saw through the water at the fountain. I couldn't believe it. We had toured all of the ships except one. As we approached the ship we noticed the boarding ladder was made of 2x4's instead of they typical aluminum boarding ladder. 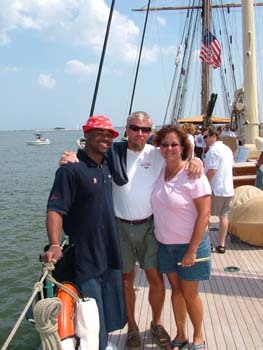 Guess what, we actually were the FIRST people on the Tall Ship Bermuda. Riet, gave the first tour and he gave us the best tour of the day. He actually took us into the engine room, lower left, which none of us could believe but loved going into. 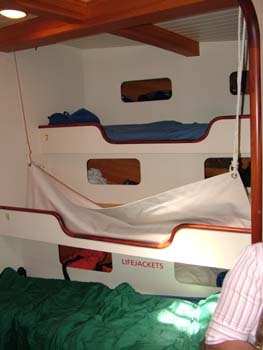 Then through the galley and into the sleeping spaces which you can see to the lower right. In all of the ships, personal space is at a minimum compared to the boat we live on. However, their navigation and other equipment is much more advanced. Regardless, I think each of us enjoy our lives. By the way, that is Bill and Christy with Riet. 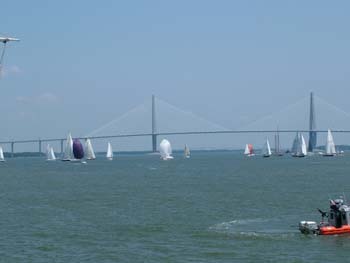 It just happened that the Charleston to Bermuda race was starting on Friday at noon. 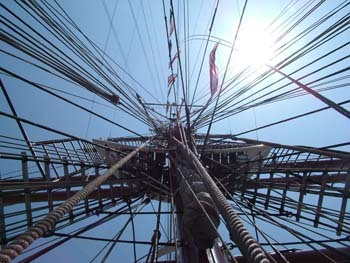 We boarded one of the Tall Ships at 11:55 and got the pictures you see to the left and below. 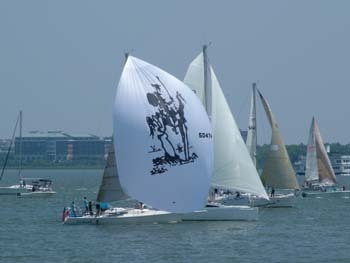 The bottom line is they have to sail around behind the starting line and then when the cannon goes off they can cross. Of course they have to be concerned about hitting each other and right of way rules apply. To the lower left you can see the boats just after they started and they some of them were flying spinnakers and others weren't. I'm guessing there are a number of categories for the different boats. To the lower right you can see a few closer shots as they sailed by. 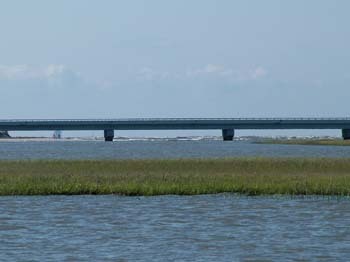 We left Charleston Saturday morning and back to the marsh lands. We fought the adverse tides all day but it really didn't matter. 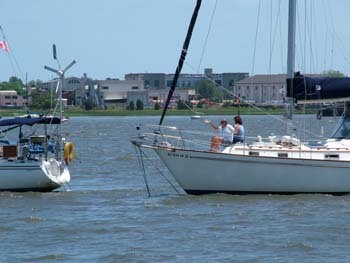 We are heading to Georgetown, SC and are meeting up with Gary and Shirline for lunch on Sunday. It is actually pretty good because we are traveling with Bill and Christy. Even though we are really on our own, if anything happens we know the other is around just in case. 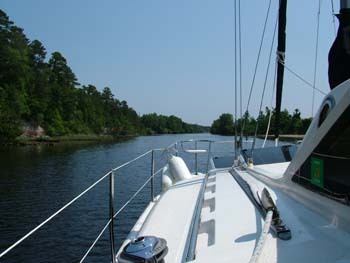 May 23 - We arrived in Georgetown, SC with Veranda and anchored in the heart of the town. Initially, we were both disappointed because it just looked too industrial and a bit run down on the north end. There was an old steel factory and a paper mill at that end of the anchorage. The smells were not that great but when you got into the town you found a great little friendly place. They told us that the smell was the smell of money. Their food was priced right and I actually liked the clock tower. They had free dinghy docks which were right in the heart of the shopping area. 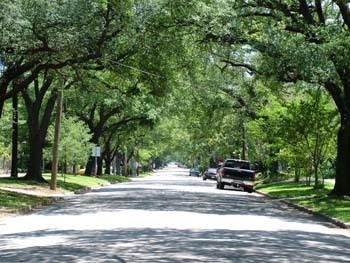 I also love a town with tree canopied streets. This is one of the many streets we walked and enjoyed as we saw the old part of the town. We didn't get our bikes out this time because we are planning on moving on tomorrow to meet back up with our friends Gary and Shirlene. We had lunch with Gary and Shirline and Bill and Christy joined us too for some good conversation. 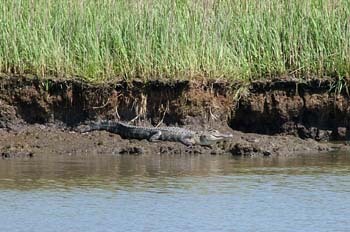 Later in the afternoon, we were on the boat when Gary saw this alligator swimming by. 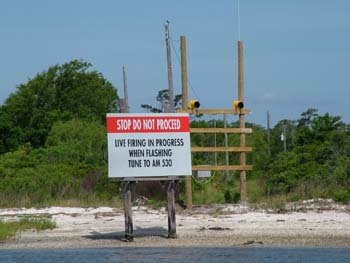 We figured out that this isn't the best place to go swimming. Gary gave me some advice about the next section of the trip and insisted that we STAY IN THE MIDDLE at the "Rock Pile" which is a section of the waterway we would go through in two days. 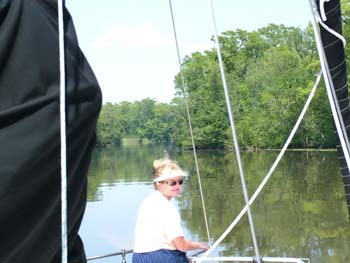 Just before we got to our anchorage in Maccamaw River, Gary had suggested, no not suggested, told me, that we had to divert off of the waterway and go through Prince Creek. This was a great idea because it was just beautiful. 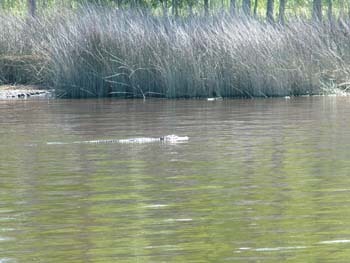 Even though there were no markers, it had great water depth throughout the short diversion of about a mile and a half. The section of water was fairly narrow but well worth the trip. You can see some pictures of it to the left and below. We have really enjoyed getting back into the area where the trees lined the waterway. I guess that is because we grew up with trees and even though we enjoyed the marshes, we like the trees better. Now if we could only find the great white beaches, clear water, and trees. 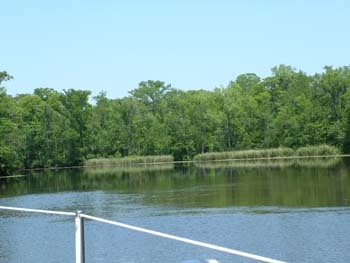 We anchored in the Waccamaw River and it was wider than Prince creek although it looked very similar. 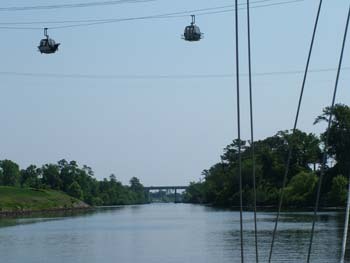 As we continued up the waterway, we saw these sky cars. At first I thought it was a ride but then figured out they were from a parking lot to a golf course. I guess they installed them before they had built the bridge you see in the picture to the right. That would be a fun way to start and end a day a the golf course. Next we began the journey through the dreaded "Rock Pile." 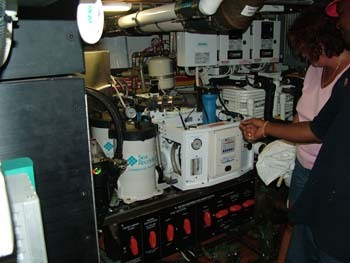 This is talked about in all the cruising guides, noted on our charts, and of course by everyone we seem to meet. This name brings images to our minds of a huge rock pile that is laying in wait to jump up and put a hole in our boat. We approach the "Rock Pile" with caution and follow the advice to STAY IN THE MIDDLE. I called to see if other traffic was out there and nobody answered so in we go. Deb is worried and I'm actually thinking this will be pretty fun. 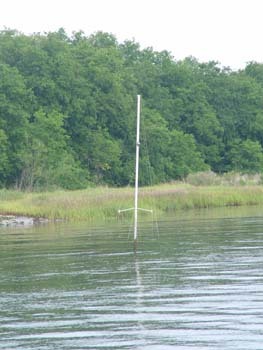 We found that you have great water depth as long as you did stay in the middle. 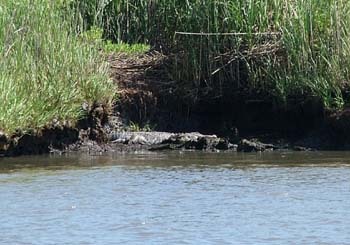 To the lower right you see some of the rocks that will "get you" if you wonder out of the channel. We were coming through just after low tide so many were visible. However, two more feet up and they would be lying under the surface ready to put that hole in your boat, tear up the propeller or take out a rudder. 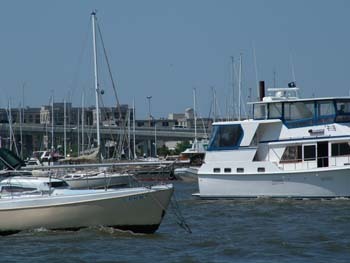 We arrived at the marina and Gary and Shirlene, far left and middle, had arranged for us to stay at the Coquina Yacht Club. 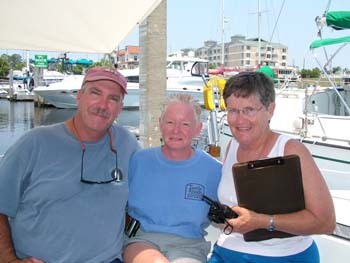 To the right is Sandy who is the dock master at the marina and she was very nice. After we filled out the form and settled up, we received the codes for the showers and laundry. They also have a nice lounge with a TV when you are doing the laundry. We got secured and then off for lunch and errands. Gary and Shirlene just moved to this area and they had purchased 4 acres of land that was full of trees. 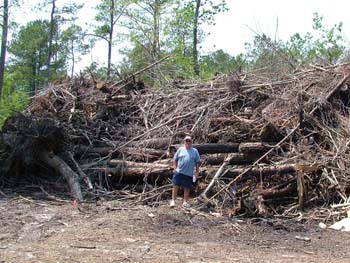 To the lower left you can see part of one of the three piles he will be burning. They have a nice house they have put up and are currently having a shop put in. To the lower right is the manager of the West Marine which Gary drove me to see. They are well stocked and have a great attitude. As we were talking to the manager, he told me he would actually pick `cruisers up if they needed something from West Marine. Talk about customer service. - Mover about that service by picture below. Craig LaForte - One of if not the friendliest West Marine managers around. 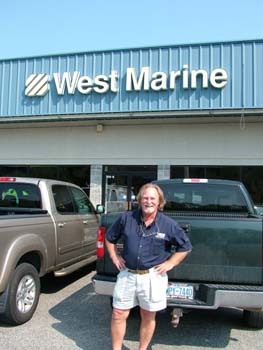 If you need parts for your boat, Craig will actually come and pick you up so you can get to his West Marine Store. You can find out if you are within range by calling him at 843-249-4999. We were staying in Coquina Harbor. May 28 - We spent the next few days restocking and primarily building the brackets for the new grill. After doing lots of comparisons, we decided on a grill from Lowe's. Gary has knowledge and equipment so we welded up the vertical brackets on a stainless steel tube and then the horizontal braces so the grill would sit in the center of the tube. Finally, we attached a brace in the back so it wouldn't shake as much when we went over the big wakes. 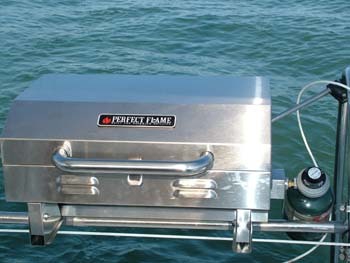 Overall, I am pleased with the project because it functions exactly like we would like plus it doesn't blow out the way our round Magma grill did. We had nothing but bad luck with that grill blowing out. We are very happy with the new one and cook every night on it now. Gary wasn't as happy with the welds because his shop wasn't completed and we had to weld out in the middle of the yard with no benches or vices. I guess it is pretty good when you consider the obstacles he overcame to give me a hand. We left Coquina Yacht Club an hour later than planned because we spent the morning cleaning up the dinghy before folding it up and putting it on the boat and I was able to wash the entire boat. When you aren't staying at marinas every week, you don't get as many opportunities to wash the boat so you do it when you can. We fueled up, pumped out and found out our vent to the holding tank was clogged. Great, another thing to fix, I just love projects although this one has a smell about it. As we moved up the waterway we encountered another bridge. Now we have taken many pictures of bridges but this is the first pontoon bridge. Yes, it floats and you can see the operator moving it out of the way to the lower left. That is him on the lower right next to the welding torch. 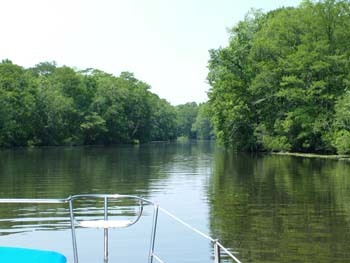 We anchored that night at Dutchman Creek which is just before you get to Cape Fear leading to Wilmington, NC. 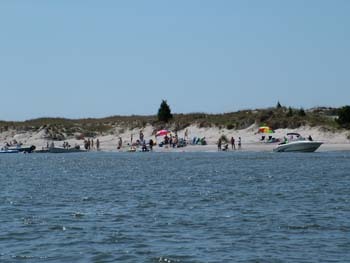 The name Cape Fear brings wild thoughts to your head about waves which will crush your boat. It just happens, Bill and Christy two days earlier had 6 foot waves they had to motor through to get up the river. They said they had salt all the way up their mast so I guess there might have been some fear involved. 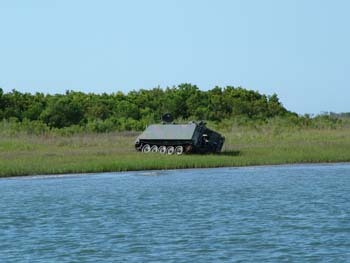 In our case, we left the next morning in calm winds and motored against the current to get through the area. This was a LONG day for us. I had gotten us underway at 6:25 am and we went until 5:30 pm that evening. 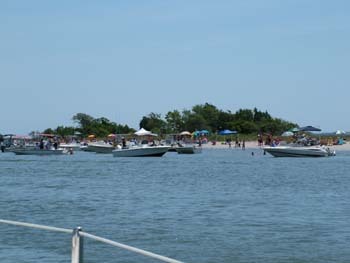 We anchored at Mile Hammock Bay which is at Camp Lejeune Marine Corps Base. You can't go ashore but it is a good anchorage. We simply grilled some chicken wings and were in for an early night. 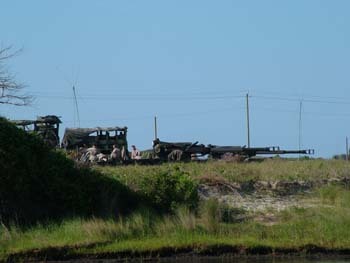 The next day we went by these guns and also a target range for tanks. Of course you do want to duck when they are firing.... They actually close the waterway. We simply get lost in time when cruising. They time goes quickly and most people wonder what we do all day. Cruising is actually a job. We each have chores we do and when underway, you must be at the helm at all times. Of course it is the most fun job I've ever had too. I tell you this because we didn't know it was Memorial Day weekend until I heard it on CNN. On this Memorial Day weekend I found out that gas prices don't matter when it comes to people using their boats. Boats were everywhere and everyone was in a hurry. We had parties on beaches, boats, and more parties on beaches. I did most of the driving on Saturday and Sunday because Deb was a bit concerned with all of the boats. Regardless, I'm sure the gas supply has now been depleted for the summer driving months. 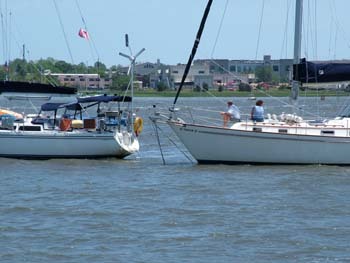 We arrived in Beaufort, NC and anchored in Taylor Creek. 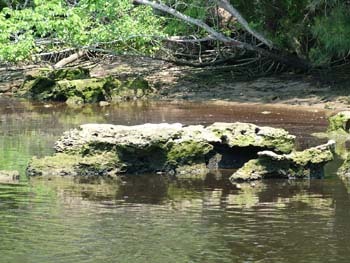 This creek is narrow and has lots of current. We had to use two anchors and stayed on the boat to see what would happen when the tide changed. We grilled a pork tenderloin for dinner and enjoyed watching the parade of boats passing us. 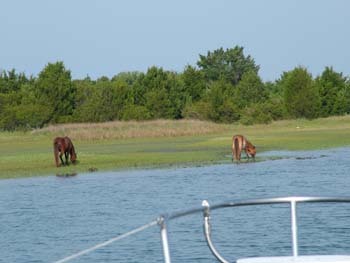 The next morning we awoke to see these wild horses on the island grazing next to the waters edge. I had heard from another cruiser there were horses here but I really don't know the story. I'm sure it goes back a LONG way so hopefully we will find it out today when we go into town. I think most people know I've not been too happy with my bottom paint because I have to clean it all the time. I'm meeting with the Interlux rep on Tuesday to find out why the most expensive paint you can buy doesn't seem to be working on our boat. Hopefully he will have some answers because it isn't fun diving to clean the bottom every two weeks. You end up with all of the sea lice over you and that isn't the way I want to get my diving fun. 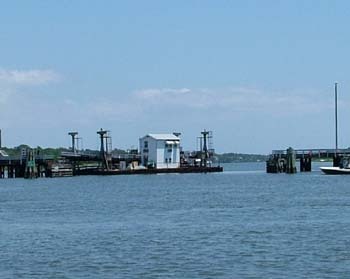 May 29 - I don't have more pictures of Beaufort, NC because I just didn't see one that you probably haven't seen before. 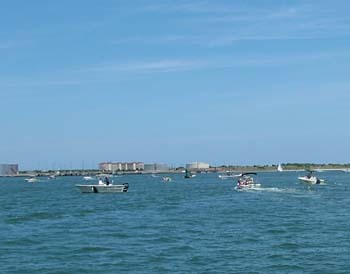 The town is extremely accessible for cruisers with multiple free dinghy docks along with a place to dump trash. 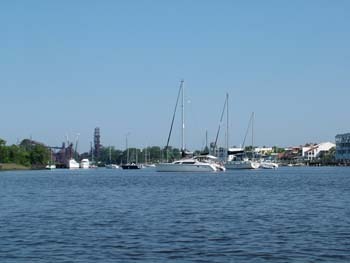 Overall, it is a great place to stop with a great view of the water and many boats. Of course, along the water are multiple restaurants with reasonable priced lunches. However, that isn't the reason we stopped here. We stopped because of my bottom paint which I believed wasn't working even though we bought some of if not the best from Interlux. I will go back in time. I had the bottom of the boat faired, coated with Interlux 2000 and then based on a recommendation from the yard, painted with Interlux Ultra before we left. 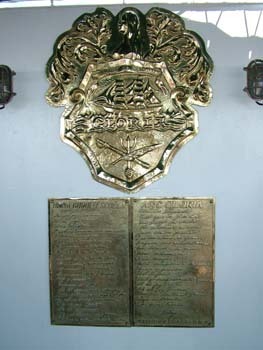 All of this was completed in August of 2006. I started getting in the water with my wetsuit on and cleaning the hull in Pensacola only to find that quickly I would notice growth on the bottom which didn't seem right by the time we reached Tarpon Springs. I was starting to get into the water on a regular basis to clean the bottom when others didn't have to. Of course, I was complaining about it too. This continued while we were in Key West when I was having to get into the water to scrape the bottom every two to three weeks. If I didn't, I would have barnacles and junk growing on the bottom. To solve the problem, I just kept cleaning. As we were moving up the east coast, I had a fellow Gemini owner email me as to why I had to clean the bottom so much. I emailed him back with my story and he said the people he knew that used this paint didn't have the problem and it sounded like something was wrong. I then decided that I would email Interlux. I have to tell you that I told them I didn't expect a reply but boy was I WRONG. I immediately got a reply from their technical support person and after a couple of emails where I clarified the problem I was having, he connected me with one of their representatives. 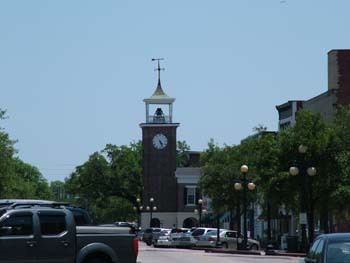 Of course, they don't have a rep in every town so after a number of emails back and forth we linked up in Beaufort, NC. For those that read my website, you know that I truly appreciate good customer service and I say so on the site. This was one of those experiences. Today, I met the rep and he came out to our boat to view the paint in person. I had sent him a high resolution picture I took in Charleston after I experienced a growth in 5 days but he needs to see the problem himself. After a good amount of time with him hanging over the side of my dinghy pulling stuff off the bottom he agreed we had a problem. He asked a number of clarifying questions but it came back to the point that, although unexplained and extremely unusual, we had a problem. He then made an offer which was appropriate since it has been almost a year since I had the paint applied, and one we could both agree to. No, they aren't paying for the entire job and I don't think they should. Instead we reached an appropriate compromise. While he was here, he went over all the types of water we will encounter over the next two years with our boat, he also went through the theories of bottom paint and came up with a recommendation for our bottom. The real "bottom" line is, Interlux has demonstrated excellent customer service and I appreciate their support. We still don't know what really caused the problem but we have a solution and they have a satisfied customer. Thank you Interlux!. Today, once we finished taking the rep back to the dock, Deb suggested that we stay another day to get the laundry finished and just kick back a bit. Being the planner that I am, I said SURE. By the way, that is for all of those people who knew me in my work life when I kept all schedules and coming at or under budget. 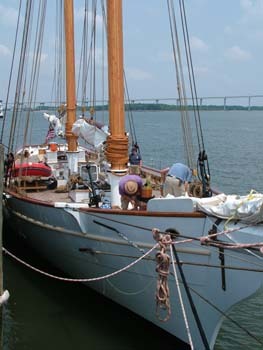 We will be off tomorrow and should be in Elizabeth City in three or four days. 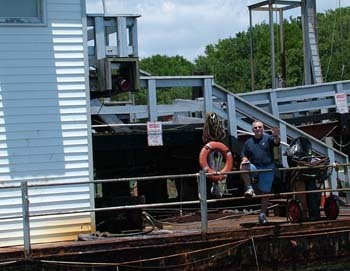 Of course that may change since another Gemini owner checked our website and just emailed us inviting us to his dock since we are fairly close to him. I promise more pictures on the next update and if you need your bottom painted, consider Interlux.